Toddler Approved! 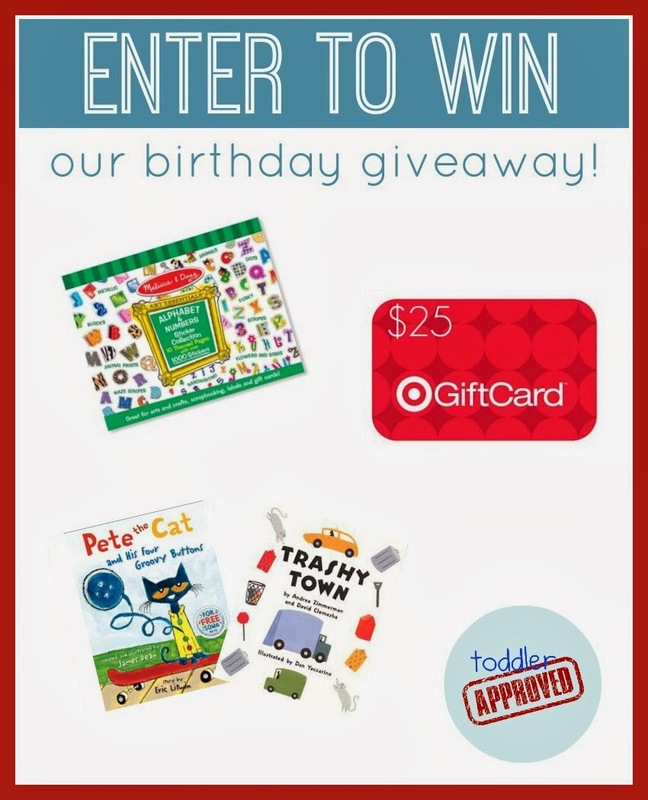 : Toddler Approved's 4th Birthday Giveaway!! Toddler Approved's 4th Birthday Giveaway!! Wow! Time really does fly when you are having fun! Today is Toddler Approved's official fourth birthday, so I wanted to celebrate it with you by hosting a giveaway of FOUR of my favorite little things! I can't believe my blog has been around for four years now. I started it when my oldest was about two-years-old and now he is in kindergarten. Crazy! If you want to read more about why we started Toddler Approved, you can read more here and here. I had hoped to get this up earlier today, but life got in the way... so it is up late tonight instead. I hope you will check out a few of my favorite posts from over the years and then enter our birthday giveaway. I'd also love to hear your all time favorite posts as well if you have a sec to comment. Here are four of my favorite Toddler Approved posts from our first year of blogging. It is fun to look back and see how much kids have grown! If you'd like to enter our birthday giveaway, here is what you can win! 1. Trashy Town by Andrea Zimmerman - I have LOVED this book since I first heard about it from Allie over at No Time for Flashcards about 4 years ago. It has been read hundreds of times at our house and I love the rhyming and simple story. 2. Pete the Cat: I Love My White Shoes by James Dean- This is a new favorite book at our house that I think is fun to read. There are several books that my kids like to read again and again that I hate reading... but I am totally fine reading (and singing) this one again and again. It is so cute! 3. Melissa & Doug Sticker Collection - Alphabet and Numbers - I can't even begin to tell you how many activities we've done with these stickers... but we've used them a lot and we are still not done with them! Hopefully you have as much fun with them as I have. 4. A $25 Target Gift Card- Target is one of my happy places. I love browsing the dollar spot and craft aisles and probably spend $200 every time I walk in there. To celebrate my blog birthday I'd love for you to spend some time at my favorite place too :) Can't wait to hear what you spend your gift card. It will be hard to decide! You can get up to twelve entries by completing all the tasks mentioned in the rafflecopter form below. Some are worth more points than others. This giveaway is open for entry from Wednesday, January 8th to Tuesday, January 14th at 12:00am (PST). The winning entry will be drawn on Tuesday, January 14th. I will notify the winner via email. Good luck! I can't wait to see who wins. Thanks for celebrating with me!! I am always looking for new ideas for my grandchildren.. this is perfect... thank you so much! I think this may have been in one of the Christmas e-mails, but my daughter LOVED dancing using the Christmas action cards. Thank you so much for an awesome website with great ideas! I am a very new subscriber so my favorite post thus far was the ice painting. Congratulations on four years! Your blog is fantastic! Yay! We have the same Blogiversary! Just one year old for me though! Congratulations! My daughter and I both had quite a bit of fun making and playing with the Footprint Ghost Puppets! How can I pick a favorite?? I love all of the book suggestions, as we are a family of book-lovers! Thanks and Happy Birthday! Happy Birthday! Cheers to a wonderful site full of amazing activities! I just found you! So far, the ice painting looks pretty great. I just found you and am enjoying exploring your blog! I'm new to here and am excited to try some of your ideas with my children! I loved the tips for dealing with toddler tantrums. Very applicable right now! As a mother of 3 year old twin boys I'm always looking for books and crafts to do with them.This blog is fantastic.Is full of great crafs ideas and advice for us mommys.I love the tips for dealing with toddler tantrums.I needed that!